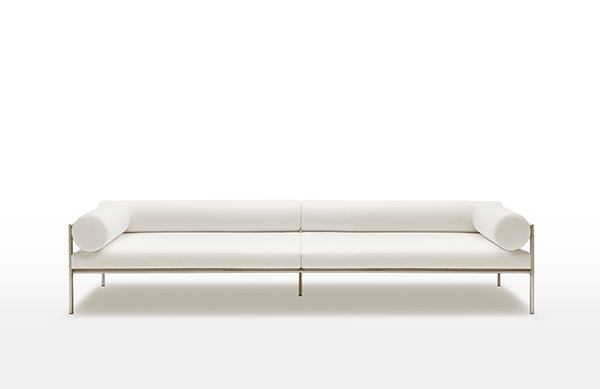 The Agra sofa and day bed is a light, contemporary addition to Living Divani's range. Reminiscent of a Turkish sofas or traditional Indian beds but with a contemporary aesthetic the Agra collection has very subtle lines. The design comes in two versions - a visible framed design or a with the frame enveloped in a precious cellulose cord or waxed rope weaving. The pure metal frame is available in lacquered gunmetal grey or in stainless steel AISI 316. The thin mattress, which evokes the formal clean lines of the sofa, is matched to soft bolster cushions that act as backrests and as armrests. The bolsters make the Agra extremely versatile sofa as the cushions can be removed to make room and transform it into a bed. This model can be used for both indoor and outdoor settings.